Dennis Samuel is your Dancing Host. Welcome to an introduction to our Ballroom and Social Dancing Classes on a Thursday evening, at Milber near Newton Abbot. The class is from 7pm to 9.30pm. The first half hour is for basic steps, ideal for beginners to start out and learn how to hold your partner, move and balance in Ballroom Dancing. Then, from 7.30 the main class begins with instruction in all types of Ballroom Dancing as well as the Social Sequence Dances that we always do when attending a properly run dance. These classes are just right for those who have never danced before, have two left feet or are stone deaf when it comes to music. Yes, we’ve heard all of these excuses before but we have also heard the joy when someone makes progress and learns to dance. 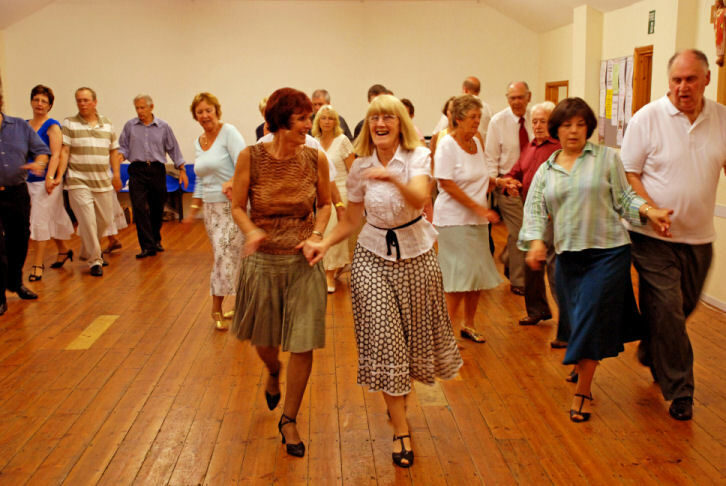 We also welcome regular dancers who want to brush up on their Social Dancing skills. We particularly welcome Gentlemen dancers as we always have a number of ladies looking for a dance partner and in addition we welcome couples who are about to get married, who want to make that first dance at their reception a special occasion. Attendance is usually between 10 and 38 dancers so pleanty of room for everyone. In the classes we cover all types of dancing from Ballroom: Waltz, Quickstep, Foxtrot etc, to Latin: Rumba, Cha Cha Cha, and the Social Sequence dances such as the Mayfair Quickstep, Square Tango, Rumba N° 1 and many, many more. We will also be doing other types of dancing including Rock & Roll, Line and Barn Dances. In fact, everything for you to be able to get on the floor and DANCE. The Classes are at St Lukes Church Hall. Laburnham Road. Milber. TQ12 4LQ (Near the Penn Inn roundabout) on a Thursday. They run from 7 to 9.30pm. To find St. Lukes, most of you will have seen the church, up on the bank beside the road. It lays back, is a white square building with a green pointed roof. With the construction of the new bypass you will have to go around the block to get to the hall. For more information please contact your host, Dennis Samuel. The answer is "NO WAY". We do not agree with this and so you only pay when you can come. If you have something else on one week you will not loose money by not attending. As a bonus, our fees include your tea or coffee and, at Milber, a biscuit so good value all round. Those first steps were difficult for us when we were learning so we know what you will be going through and know we can help you overcome your fears. Maybe it’s the Summer season of Dances and Balls or it could be a forthcoming Wedding. Did you sit out at that last firms dance? Or is New Year upon us and you want to see out the old year, along with other like minded people, dancing the night away. If so then now is the time to learn. Dancing helps to keep you fit and is a wonderful way to meet others so do come along, Thursday evenings. We look forward to seeing you, on the dance floor. It is with some regret that we advise dancers that on Saturday 3rd February 2018 after a short period of health problems, Sid Gateley passed away. Although he had been ill his death was unexpected. It was only a couple of months previously that Sid & Ross decided to retire from hosting dancing events. When he was first ill I took over the Tuesday evening Dances at The Livermead House Hotel in Torquay. I now host these dances. For more information see the Calandar page. You will be most welcome to attend these dances. In addition, we are hosting a Dance Break Weekend at The Langstone Cliff Hotel. Dawlish Warren, our Late, late Great New Years event on 4th, 5th and 6th January 2019 and we already have bookings for 8th, 9th & 10th Novdember 2019 and 3rd, 4th & 5th January 2020. For more information about these Dance Breaks please contact me. 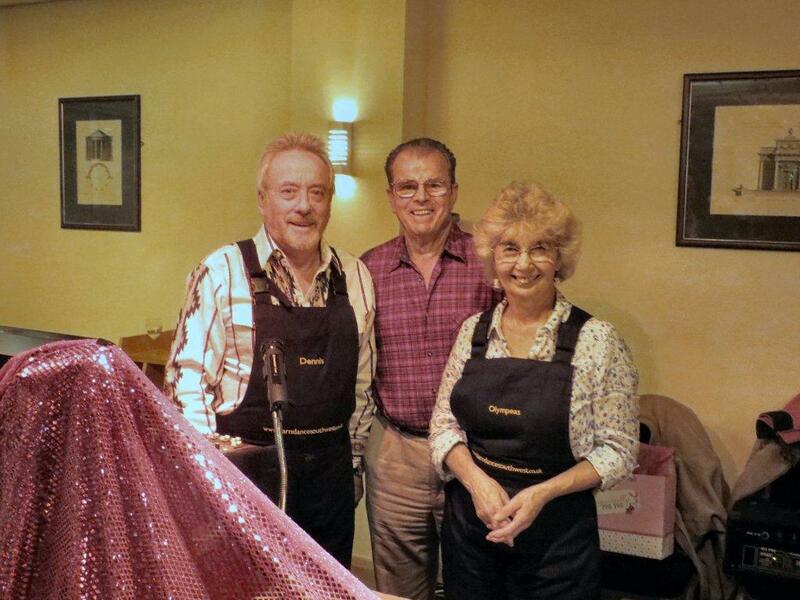 Apart from hosting Ballroom Dances under the name of "Dancing with Dennis", Dennis is also a Barn Dance Host where, with special recorded music, he teaches every dance so that everyone, from 9 to 90 can enjoy an evening of fun and enjoyment. Dennis' style is popular for special events for clubs and organisations as well as corporate events and charity fund raising but more and more these days, Brides and Grooms want the atmosphere of a Barn Dance at their wedding reception to mix everyone together and to make sure of a most memorable evening. Venues that we have worked include The Belgrave Hotel. The Grosvenor Hotel. The Derwent Hotel in Torquay. Holiday Centres in Brixham, Dartmouth, Shaldon. Large Halls in Exeter and Plymouth as well as many country clubs, golf clubs and other venues such as farm barns, schools and village/church halls both in and around Devon and beyond. We have also taught Ballroom and Social Dancing on board Royal Caribbean International Cruises. We have worked on their cruise ships The Independence of the Seas, The Jewell of the Seas and The Radiance of the Seas with cruises to Spain and the Canary Islands, Scandinavia and Russia as well as Spain, the Mediterranean Sea, Majorca, Barcelona, Italy, Gibralta and back to Spain again. We have also done the trip along the southern coast of Australia, taking in New Zealand. What a fantastic trip. For details of these cruises as well as others, please get in touch with us as we work closely with a company in America who can offer special deals on cruises with Royal Caribbean Cruise International and Celebrity Cruises. Both really special companies with very special ships. For that extra special service, remember to tell them that "Dancing Dennis" sent you. We would be pleased to discuss your dancing needs, be it for Ballroom Dancing, Barn Dancing or other events such as family parties, weddings, tea dances, social or charity events as well as hosting concerts, events etc. We can host Dance Breaks as well as one off parties. Dennis also offers a Master of Ceremonies service for that special occasion. So, if you want to learn to dance or would like more information on our services, please do give us a call on: 01803 299791 or see our entry in the Database of Information. You can also contact us by Email. Click on the CONTACT US page now. We look forward to meeting you on the Dance floor. All dressed up and ready for a Barn Dance. Dennis with his wife, Olympeas.